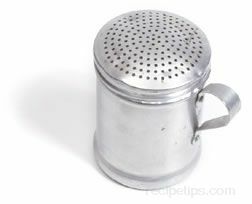 A container with small perforated holes that is used to hold flour, herbs, or other similar ingredients that are sprinkled on foods that are being prepared. As an example, a flour dredger is used to sprinkle a light coat of flour on the dough when it is being worked, such as occurs when making bread or pasta. A flour sifter can be used in the same manner. There are a variety of kitchen tools and utensils that are made as dredgers, but a common one is a covered can with perforated holes spread around the cover so that the flour can be dispersed evenly from the can as it is shaken over the dough. This tool may also be referred to as a flour or sugar shaker.